Did you know our Asian Pears are grown in Pennsylvania? Wonderful way to celebrate something local! Our Asian Pears are tree-ripened; they are ready-to-eat when you receive them. Unlike their European cousins, Asian Pears do not need to sit out to soften; as they are best enjoyed crisp and firm. Asian Pears should be kept refrigerated for ideal enjoyment; unwrap your fresh Asian Pears and store them in your crisper drawer. Your fresh pears will last about a month if kept refrigerated. Traditionally Asian Pears are enjoyed peeled, but for several of our varieties the skins are a tasty way to enjoy the benefit of vitamins and minerals. Asian Pears are also full of Lutein and high in fiber. Our fresh Asian Pear season is September through December, annually. Place an order reservation anytime! Our dried Asian Pears are a delicious way to enjoy our pears when our fresh fruit is not in season; they are delicious all by themselves and also fantastic in a salad or with cheese. 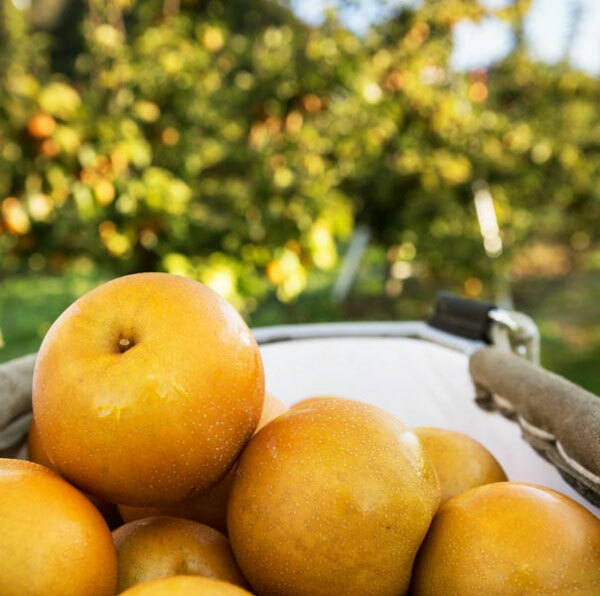 Shop now for currently available offerings from our orchard or visit our recipes page for wonderful ways to enjoy our fruit!